While no professional teams are based in Alaska, the Mat-Su Valley does not have a shortage of options for sports fans. Don&apos;t miss an inning of Mat-Su Miners baseball, a collegiate summer team that plays in the Alaska Baseball League. Games are at Hermon Brothers Field on the Alaska State Fairgrounds, and with sweeping views of the Chugach Mountains, there is not a more picturesque ballpark in the country. Several Major League Baseball players got their start in the Alaska Baseball League. Other Alaska Baseball League teams are based in Kenai, Anchorage and Eagle River. Golfers are treated to some of the most picturesque courses in the country. Grab your clubs and tee off under the Midnight Sun at one of two Valley courses, which feature views of mountains, glaciers and rivers. Motor sports enthusiasts have plenty of options in the Mat-Su Valley. Alaska Raceway Park, located just outside Palmer, features a race track and a drag strip, with races held every weekend in the summer. There&apos;s also a race track and drag strip in the Palmer area for race car enthusiasts. 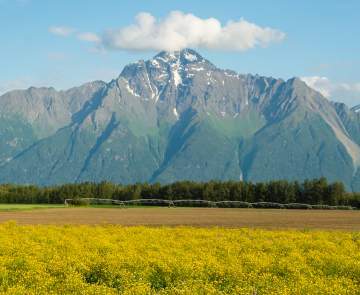 For runners, the Mat-Su Valley is home to 5K races nearly every weekend. Don&apos;t miss the Bill Mitchell 5K Race during Colony Days (second weekend in June in Palmer). Check our calendar of events for upcoming races and dates. Visit the hiking and biking trails page for details on trail conditions, maps and options. 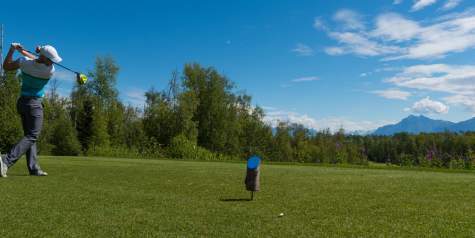 The Mat-Su Valley is home to several golf courses that boast amazing views of rivers, mountains and glaciers.